Home / Health / What is the difference between butter and margarine? For thousands of years people have been producing butter from cow’s milk. This is certainly a fine and tasty ingredient which is used in many dishes for cooking, sauces or bread spreads. Butter like other products of animal origin, contains saturated fats. Saturated fats when exposed to normal room temperature remain solid. This is why butter maintains a solid shape which is practical to use for spreading or for cooking. Unfortunately, the excess consumption of saturated fats is accompanied by many health dangers including obesity, increase of bad cholesterol and inflammation of the arteries. When people realized the dangers inherent from the consumption of saturated fats, it became necessary to find ways to replace butter in the diet with other items that were free from excessive level of saturated fats. In addition, modern lifestyle poses many threats to our health, obesity levels are raising, heart diseases are increasing and combined with a significant reduction of physical activities and exercise, the restriction of saturated fat in the diet is more than essential. After understanding the risks of butter, margarine became an attractive and popular option. Margarine is made of polyunsaturated vegetable oils. Vegetable oils contain no saturated fats so margarine is considered a perfect replacement for butter. Unfortunately recent scientific findings brought into surface new facts about margarine. During the manufacturing process of margarine (some types not all), when polyunsaturated vegetable oils are partially hydrogenated to produce margarine, they create trans fats. Many studies have shown that trans fats are equally harmful to health as saturated fats contained in butter. Trans fats are able to cause inflammation, clogged arteries, weaken the immune system and have been associated with increased incidence of allergy and asthma. So studies have shown that both butter (with saturated fats) and margarine (with trans fats) have negative effects on our health. To be fairer, we need to mention again that not all margarine types contain trans fat and that a healthy balanced diet allows the consumption of a small percentage of saturated fats. What is the daily allowance of fat in a balanced diet? Following the recommendations of dieticians, the total fat intake from our diet, must be about 60 to 70 grams daily. This should represent 25% to 35% of total daily calories. Of the total calories taken from fats, only 10% can come from saturated fat. For a person who needs about 2,000 calories each day, the 200 to 300 calories could come from saturated fats. Taking into account that 1 gram of fat has 9 calories we see that the total amount of saturated fats (butter and other animal products) which may be contained in our daily diet is actually very small ie 22 to 32 grams only. Of course we must not forget that there are exceptional delicious alternatives to replace both butter and margarine. Olive oil and other vegetable oils can be used for cooking in place of butter or margarine. They have beneficial health properties, can withstand high temperatures and do not contain saturated or trans fats. Also for a bread spread we can use a mixture of olive oil and vinegar which gives a distinct flavour. For the baked potato instead of using butter, margarine or cream we can use a sauce of vegetables rich in antioxidants or olive oil. For steamed vegetables instead of butter or margarine you can use lemon, nutmeg and olive oil. It is also important to note that there are many other foods which contain saturated and trans fats. Many ready-made foods, snacks, biscuits, cakes and others are manufactured using trans fats, so as to increase their retention period. Also a steak weighing 225 grams contains at least 20 grams of saturated fat, a grilled chicken breast with skin contains 9 grams of saturated fat, a moderate portion of French fries contains 8 grams of trans fats and a donut contains 4 grams of trans fats. So, which is better butter or margarine? 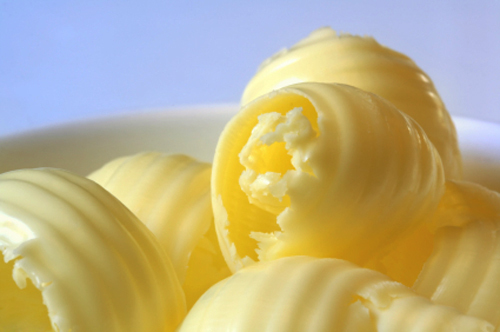 Margarines made from vegetable oils that contain no trans fats are healthier than butter. It is therefore essential before you buy margarine to study carefully the nutrition label and ensure that it contains to trans fat. Soft margarines or in liquid form usually do not contain trans fat but better check the food label. Now that you know the difference between butter and margarine, you can be more careful and adjust your diet to limit to the maximum possible extent the intake of fats. Do not forget that excess consumption of fats will lead to weight gain and obesity and at the same time damage the circulatory system, arteries, heart and brain thereby reducing the length and quality of your life.